Tackling the regional imbalances within the UK economy has been a key government priority over the past few years. To this end, there have been a plethora of new initiatives, including: the establishment of Local Economic Partnerships (LEPs) to replace the defunct Regional Development Agencies; the creation of nine Combined Authorities in metropolitan areas of England; a raft of devolution deals, including for some rural areas; and, of course, the ‘Northern Powerhouse’ and ‘Midlands Engine’ projects. These policy interventions aren’t going to move the dial for some time. So there was never any expectation that the latest data on regional and local economic performance, released on 20th December by the Office for National Statistics (ONS), would show any narrowing of the long-standing regional divide. And indeed they didn’t. Nonetheless, the latest data, which incorporate some significant methodological improvements, reveal in stark terms the scale of the challenge, and will serve as a useful benchmark for assessing future progress. As ever, there are some important caveats that need to be dealt with before diving into the figures. It is fair to say that the history of regional economic statistics has been a chequered one, punctuated by large revisions and major methodological changes. The latest release incorporates a number of such changes. In particular, the two previous approaches to measuring economic activity (‘output’ and ‘income’) have been combined into one ‘balanced’ measure, and much of the data is now adjusted for inflation, which means that it is easier to make comparisons with UK-wide indicators. It’s important too to recognize that economic activity, as measured by gross value added (GVA), is not the same thing as ‘wealth’ or ‘prosperity’. Some coastal areas, in particular, appear to have a woeful economic performance, especially when making comparisons of GVA per head in relation to the national average; but these areas are often home to many retired people, and often do much better when judged in terms of household income or wealth. In any case, comparisons of GVA per head must be treated with care, since regional economic data are compiled on a ‘workplace’ basis. This is fine as far as it goes, but dividing the GVA by the resident population to get a per head figure can be misleading when there are large commuter flows, notably those into London from the surrounding areas. A regional snapshot of 2016 The statistics published on 20th December present consistent datasets from 1998 to 2016. The figures for 2016 are deemed to be ‘provisional’, but the regional differences are unlikely to disappear when the final figures are released. These differences in performance are large, and somewhat worrying. Taken as a whole, the UK’s GVA increased, in real terms, by 1.6% in 2016. 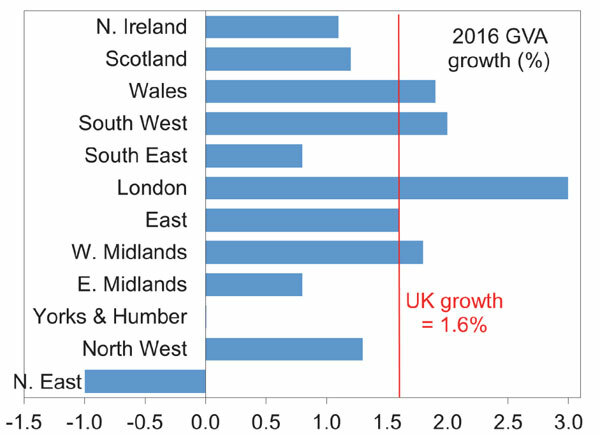 Only four of the twelve regions achieved growth in excess of this figure: these were London, at 3.0%; the South West, at 2.0%; Wales, at 1.9%; and the West Midlands, at 1.8%. On the downside the two clear outliers were Yorkshire and the Humber, where the economy didn’t grow at all, and the North East, where GVA is reckoned to have contracted by 1.0%. The East Midlands and the South East also turned in distinctly underwhelming performances, with GVA expanding in both cases by a lacklustre 0.8%. Digging into the numbers, the North East suffered from the closure of the SSI steelworks at Redcar, and from a relatively poor performance by its important chemicals sector, with the result that manufacturing output fell by 3.5%. More worrying, however, was the downturn in some areas of the services sector, which are generally reckoned as more reliable engines of growth in a modern economy. In particular, steep declines in GVA generated by the telecommunications and insurance and pension fund sectors knocked nearly one percentage point off the North East’s overall growth rate. Meanwhile, in the adjacent Yorkshire and Humber region the biggest drag on growth was a plunge of 11% in the output of the finance and insurance sector, while production of basic metal goods fell by a quarter. 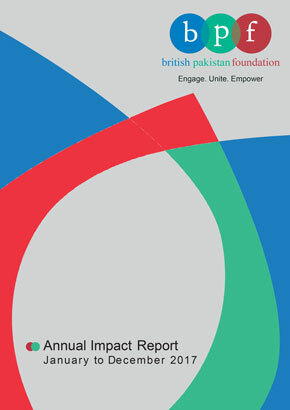 For both regions, matters were also not helped by their long-standing reliance on the public sector, with continuing austerity leading to further shrinkage of activity in public administration and defence activities. Meanwhile, London’s economy continued to surge ahead. At the rate things are going, London will account for a quarter of the country’s total GVA by 2020, compared with a fifth in the late 1990s. It might have been supposed that the Capital’s strength in financial services would have been something of a millstone: after all, at a national level the sector’s output is still some 15% down from the pre-crisis peak. 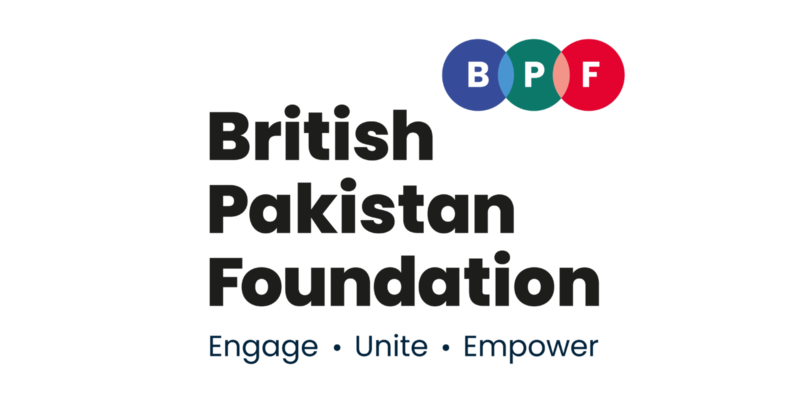 But London has more than one string to its bow, and has continued to achieve much faster growth than the rest of the country on account of its strength in information and communications and professional, scientific, and technical activities. These two sectors now account for nearly a quarter of London’s GVA, and achieved respective growth rates of 10.4% and 5.5% in 2016. Looking further ahead At this stage it’s hard to say anything meaningful about regional trends in 2017. It will be another year or so before the ONS releases official figures, so the only guide comes from surveys of private sector businesses, such as the regional Purchasing Managers’ Index (PMI) surveys, and from the figures for regional labour markets which are captured as part of the national Labour Force Survey. But the business surveys are often based on small samples, and neither they nor the key labour market metrics, such as employment growth and the unemployment rates, show any clear correlation with the short-term trends in economic growth as reported by the ONS. In general, regional growth rates can be expected to converge now that the economy as a whole is approaching full employment. The past year should also have been a better one for those regions, such as the North East and the West Midlands, which have relatively high concentrations of manufacturing activity, as this sector has enjoyed a minor renaissance over the past year. By contrast, London’s bubble may have been deflated somewhat by the fall-out from Brexit, which include the concerns about access for many service industries – including financial, legal, insurance and broadcasting services – to the EU’s Single Market after March 2019. Same winner, different losers The gulf in the economic performance of the countries and regions of the UK during 2016 was not a ‘one off’. The table below lays out in grisly detail the story of the UK’s evolving regional divide since the late 1990s. The picture has altered somewhat since the financial crisis, but there has been no change in the dominance of London. The malaise in the financial services sector has reduced London’s growth advantage; it hasn’t caused it to disappear. The biggest difference pre- and post-recession is that the big losers are now the North East and Yorkshire and the Humber, whereas in the years before 2008 it was the two Midlands regions (West and East), and Wales. For the UK as a whole, GVA in 2016 was 9% higher in real terms than it had been at the onset of the so-called ‘great recession’ in 2008. Over the same timeframe, growth has been close to the national figure in the South East, the South West, the East of England, and in Scotland. In the North East and in Yorkshire and the Humber, however, GVA in 2016 was up by less than 2% compared to 2008, while cumulative growth in Northern Ireland and in the North West was just 4% and 7% respectively. That left just three regions which outperformed the national trend. There are no prizes for guessing that London once again led the pack, and by a proverbial country mile, with GVA expanding by over 17% between 2008 and 2016. The recent experience the West Midlands and Wales, which have also outperformed the UK average since 2008, suggests that it is possible to move the dial. In the decade before the financial crisis the West Midlands achieved slower growth than any other region, but saw an above-trend increase in GVA of 12% in the eight years to 2016. It is tempting to believe that this gear shift is largely down to the renaissance of the motor industry in the region, where output has tripled since 2009. But there’s more to it than car manufacturing, which still accounts for only around 5% of the region’s total GVA. The real story of the region’s climb up the pecking order has been diversification into services. In particular, the distributive trades (retailing and wholesaling) have been a source of strength, and there has also been impressive growth in the smaller administration and arts and recreation sectors. *GVA is allocated on a workplace, rather than a residence basis. (1) excluding extra-regional activity. (2) Extra-regional activity largely comprises the production of oil, gas and wind energy from the Continental Shelf. 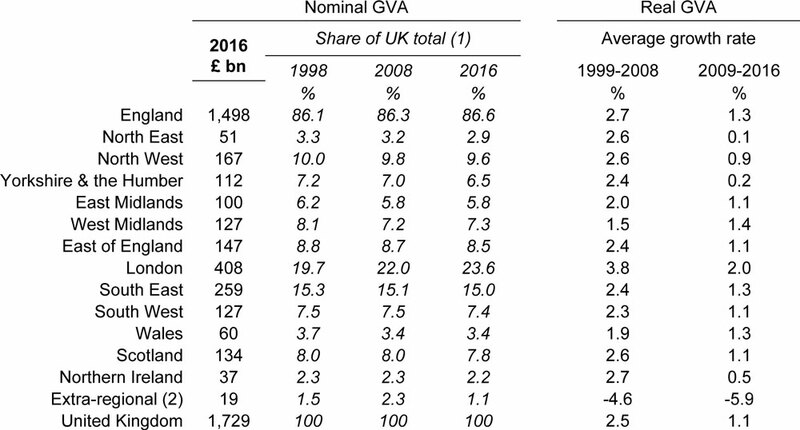 Source: ONS, Regional Gross Value Added (Balanced), UK, 1998-2016; 20 December 2017. In Wales meanwhile GVA expanded by 11% between 2008 and 2016, following many years of underperformance. But this hasn’t been a story of moving from low-growth manufacturing into higher-growth services. Instead, the manufacturing sector has continued to be a source of strength, with strong growth in the aerospace and food and beverages sectors helping to mitigate the well-publicised difficulties in the steel industry. Elsewhere, there has been rapid growth in the Principality’s farming industry, while the public sector has contracted less than in most other parts of the UK. The relative improvement seen in the West Midlands and Wales in recent years is a cause for optimism that the regional divide doesn’t have to become set in stone. Yet it’s also unclear to what extent, if any, these improvements were facilitated by government-led interventions. After decades of uneven growth there are stark differences across the UK in living standards, which are also reflected in life expectancy and other health indicators. Bearing in mind the caveat at the start of this piece about the use of GVA data on a per head basis, it still tells an important story, especially if the distortions from commuting are mitigated by lumping London, the South East, and the East of England into one ‘greater southeast’ region. Stark differences are still evident GVA per head lags the UK figure by around a quarter in the North East, in Wales and in Northern Ireland. It trails the national average by about a fifth in Yorkshire and the Humber and in the East Midlands; by around 15% in the North West and in the West Midlands; and by just under a tenth in the South West. In Scotland, GVA per head comes out either a little below, or a little above, the national benchmark, depending on how activities on the Continental Shelf are treated. That leaves the ‘greater south east’, accounting for 46% of the UK’s economic output, achieving a level of GVA per head which is around 35% above the national figure. The inescapable conclusion is that if the government is going to make a difference it will have to act on a fairly grandiose scale: tinkering around the edges is unlikely to make much of a difference. Yet even if the government decides that it can spare the money for meaningful interventions, there is always the risk that they turn into white elephants. It is in this context that the recent spate of devolution deals is significant. Detractors argue that these deals are merely small sops offered by a cash-strapped central government which will serve only to shift more of the blame for ongoing under-performance onto other shoulders. On the other hand, it’s rare that Whitehall offers to cede any powers, and the ability to shape local policies on transport, housing, and skills could make a real difference after decades of dancing to the tune played by the government in London.